As far as returning to games go, this one was a bit more low key for me. 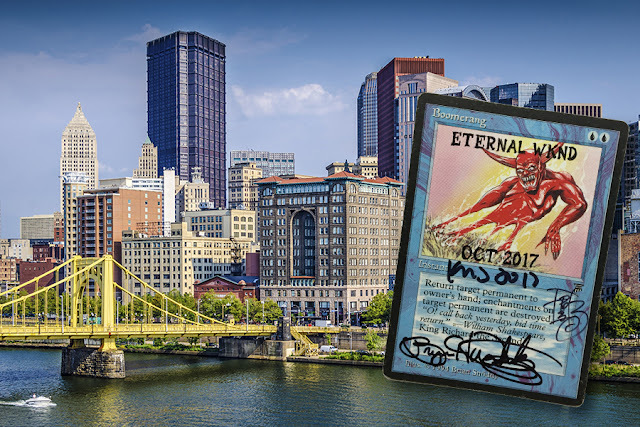 When I first started playing Magic, I actually lived in Pittsburgh (well just outside, but close enough). I fell in love with the city then and still like to go back when I can. Playing Magic introduced me to a whole new group of folks I would have never met if I hadn't played that crazy card game. I will be forever grateful for those gamers and memories. Visiting local game stores and playing each weekend allowed me to trade for the cards I needed to build my deck and continually hone my deck building and playing skills. You have to remember that back then (mid 90's) there was no internet and outside of buying the occasional card at your local store, you built your collection through the lost art of trading. But things change. It's bound to happen. I played in as many tournaments as I could and got my deck to a point where I had the cards I wanted and it played the way I enjoyed. And then I stepped away from the game. I moved to a new city and after selling a few of my cards, the rest went into storage to wait out the rest of their lives in the bottom of a cardboard box. To be honest, I'm not sure what sparked me to get back into Magic now. It's not like I know anyone that plays or I've kept up with the current state of the game over the years. I think I was cleaning out my closest one afternoon and reorganizing my game room (I actually have a dedicated game room now!) and I found some of my old cards. Seeing them brought all the memories flooding back. All of the fun I had playing. I wanted to do that again. As soon as I found my cards, I decided I would try playing again. I called my friend at my local hobby store and asked him to show me how to play again. From what I could find online, the game had changed slightly and I wanted someone who knew what they were doing to walk me through the new aspects. Turns out not too much has changed, a few adjustments here and there, but for the most part... it's still the same. I say that because it's been years since I last played and I haven't been affected by all the incremental changes over the years. I found out there is no more mana burn. What?!? That's one I didn't see coming. Fortunately, Old School gamers still keep that rule in effect. I've since managed to put my deck back together as best I can. I've tried to match the cards from memory. I had certain black bordered cards and certain white bordered ones. I'm not one of those folks who has to have all black borders; I actually think some cards look better with white borders. I like to use the version I think looks better. Strange I know, but there are worse habits to have I'm sure. When I found out there was going to be a convention in Pittsburgh, I decided I was going. I got the time off from work and made the necessary plans. I wouldn't be able to stay long... one day really, but I still wanted to go. In part to visit Pittsburgh since it's been ages and in part to see what the game has become now. That and I wanted to get some of my cards signed by the artists attending the convention. That's another post I'll be sharing in the future. I really wanted to play in an unofficial Old School Tournament being played nearby, but found out I would be ineligible due to the fact that I still had some proxies in my deck and that's strictly forbidden for some reason. It's a topic I'll revisit in a coming post. Nonetheless, I was determined to at least go to the convention. Not being able to play would not deter me. I ended up setting out bright and early that first day and made it to the convention by mid-afternoon. It was only the first day which meant the crowd hadn't grown to crazy proportions yet. Not being crowded meant I could spend a few minutes getting my cards signed and talking with the artists there. Dan Frazier, Ken Meyer Jr., RK Post, Bryon Wackowitz, Mark Tedin and Jeff Menges. For some reason Douglas Schuler wasn't there yet which was disappointing since I wouldn't be able to come back and I'd miss getting him to sign the few cards of his that I had. I spent the afternoon talking to the artists, getting my Boomerang card signed by all the attending artists, looking at all the display cases of cool cards for sale (way too expensive!) and wandering around the city visiting old familiar places. And I didn't play one game. That's right, I went to a Magic convention and didn't play a single game of Magic. And I had an absolute blast. 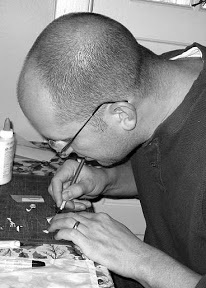 I got to talk to some artists of cards that have been staples in my deck since the moment I saw them 20 plus years ago. I collected a few signatures and then spent the evening (the weather was perfect by the way) walking around a city I love. Lots of new memories and lots of old memories. And that's what this game is really all about. Making memories. IMAGE: City of Pittsburgh, Unknown Source. My artist signed card from the day.